Make one thing better, starting with your bed. It was a simple task — mundane at best. But every morning we were required to make our bed to perfection. It seemed a little ridiculous at the time, particularly in light of the fact that were aspiring to be real warriors, tough battle hardened SEALs — but the wisdom of this simple act has been proven to me many times over. If you make your bed every morning you will have accomplished the first task of the day. It will give you a small sense of pride and it will encourage you to do another task and another and another. By the end of the day, that one task completed will have turned into many tasks completed. Making your bed will also reinforce the fact that little things in life matter. If you can’t do the little things right, you will never do the big things right. And, if by chance you have a miserable day, you will come home to a bed that is made — that you made — and a made bed gives you encouragement that tomorrow will be better. If you want to change the world, start off by making your bed. Readify is a very culturally diverse organisation: a quick scan of my inbox right now shows names like Korczynski, Mutandwa, Shah, Saikovski and The. “Tatham” isn’t exactly simple either. We’re also distributed across many different client sites spread around the country, which means a lot of our conversation is via email. I recently came across an Aussie startup called Vame.me, via a Shoestring article. I’m a sucker for well implemented simple ideas, so I gave it a go. I like it, not because I’m precious about my own name (I’m really not), but because I like knowing how to pronounce other peoples’. There’s been a bit of adoption across Readify already, and I look forward to seeing it grow. It’s hard to really tell how useful it is, as it’s not the type of thing people really call out a lot. I have been tracking click-throughs though, and it’s getting a few. Earlier today, I posted some considerations on readify.net for those people who work in Microsoft-centric organisations. Fortunately or unfortunately, Git won over Mercurial. I placed a few bets on Mercurial at the time, so I have a bit of a tail of repositories left to convert. Converting on Windows with full fidelity isn’t really possible. None of the scripts work well, and the case insensitive file system can cause issues. 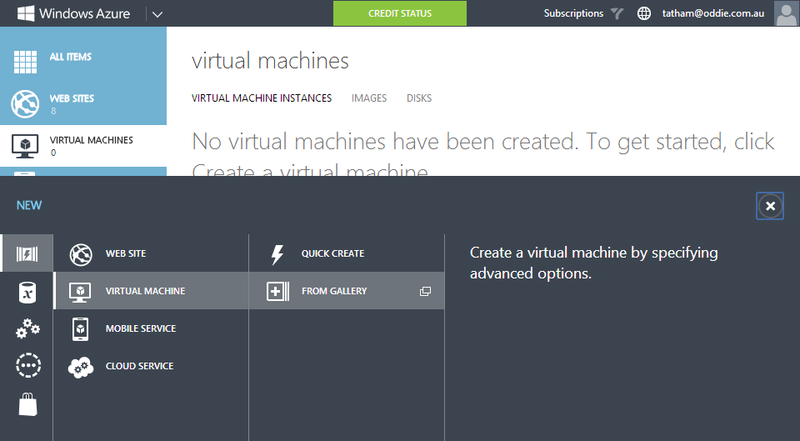 Luckily, Windows Azure makes it super easy to borrow a small Linux instance quickly. I’ve documented what I do in this post. Anybody with a web browser can follow these steps, on any platform. There looks like a lot of steps, but that’s just because I’m spelling out every last detail for clarity. Choose an Ubuntu release. As of this post, I chose Ubuntu Server 13.10. For this, we’ll just be connecting to a command line via SSH: no GUIs will be harmed. Because SSH is so prevalent, there are tool chains available for every platform. I’m actually writing this post on my Surface RT (not Pro), using an app called SSH-RT from the Windows Store. Ubuntu doesn’t ship with Git or Mercurial installed by default, but it does have an awesome package manager called apt-get. The sudo prefix is a command to elevate your permissions, kind of like a UAC prompt on Windows. We’ll be using a tool called hg-fast-export to convert the Mercurial repository to Git, without having to replay each individual changeset like some tools do. This tool is in a Git repo, so we’ll just clone that repository down in order to get it onto the VM. For the sake of simplicity, we’re just going to use HTTPS instead of SSH. Take the opportunity now to convert your .hgignore file to an equivalent .gitignore one. You can go and do this back on your own machine. You’re all done. Wasn’t that just a perfect, easy use of the cloud? We are still not sending around (locally) enough meeting notes and not sharing information more freely. And part of that is asking people to be more receptive to “raw data” and less demanding of “tell me what is important” because with empowerment comes the need to process more data and manage the flow of information. For our process to work smoothly we do need more communication. Within Readify, we’re seeing a fast growth of shared OneNote notebooks. They’re like wikis on steroids: near real-time multi user editing, ink, images, audio, no save button, multi-device, offline support, web app, deep linking right down to a specific paragraph, and more. They’re an insanely useful part of our information flow, and deserving of their own post another time. The ease of access that comes with these pervasive notebooks has lowered the bar for content capture. And it’s great. These notes don’t provide the full context of a project, but they capture a series of events that cumulatively provide much of that context. They aren’t an analysis of the events either; they’re a summary, closer to a transcript. But that’s all ok, because they create visibility across our teams and open conversations we weren’t having before. Seeing this transition sweep across our business, I have to say that I wholeheartedly agree with Steven’s views. Special thanks to fellow Readifarian Richard Banks, who actually had the slides already.